This article originally appeared in Canadian Business, July 2013. It is a wintry December day in Montreal, and a film crew in tattoos and toques is waiting patiently for a three-year-old tropical parrot named Isa to fly. Aimed squarely at the bird is the Phantom, a camera originally invented for ballistics research that can produce ultra-slow motion video by shooting at about 4,000 frames per second. A trainer beckons Isa with a peanut. She takes to the air, flying three metres. But when the crew looks at the footage, they can only see the corner of a crimson wing in the frame. The shot is useless. Parrots tire easily—Isa will only make about 10 flights today, and she’s already done six. The plug of one of the 5,000-kilowatt lights is starting to overheat, and the smell of burning rubber is in the air. It’s a low-tech dilemma for Moment Factory, a Montreal multimedia company adept at solving high-tech problems. They are filming a capsule, or short clip, to add to the catalogue of images, sounds and interactive elements that will fill a brand-new terminal at the Los Angeles International Airport (LAX). The $450,000 Phantom is on rent from the U.S. because its high frame rate means a 1½ second shot can be slowed to a hypnotic pace and made to last as long as it takes to wait for a flight. But first, the parrot has to want the peanut. Suddenly, Isa is flying, but too far. She wheels left into a storage space, disoriented and tired. “No, no, no,” someone shouts. After a hair-raising U-turn, she alights on producer François Morel, a tall fellow with snow-white hair, who laughs it off. She is coaxed back in front of the green screen and convinced to fly once more. There are cheers: they have a shot. Still, there are countless more shoots to go, and many more pretty things to fly out of control. 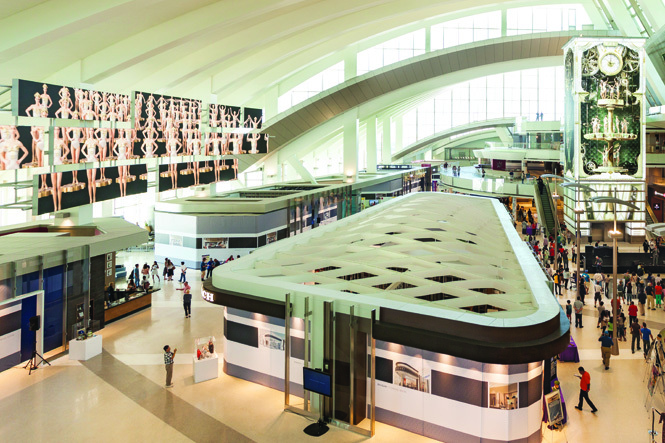 Five months and 29 days after Isa’s flight, on June 20, Antonio Villaraigosa cut the ribbon on the new US$1.9-billion Tom Bradley International Terminal, one of his last hurrahs as mayor of Los Angeles. Due to construction delays, the work isn’t completely finished. 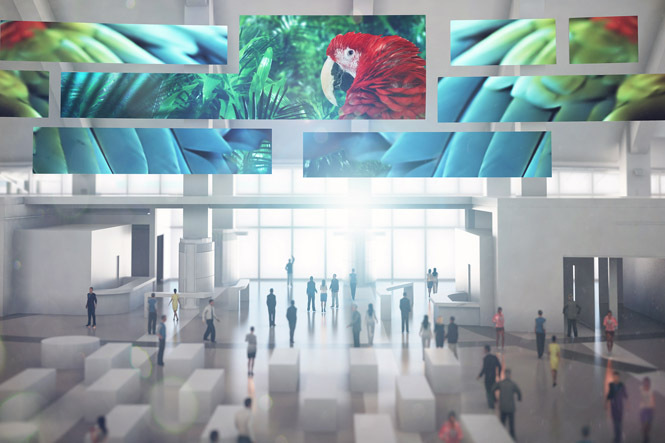 But when it is, Moment Factory will have plastered the terminal’s Antonio R. Villaraigosa Pavilion—consisting of a departure lounge and shopping area the size of three football fields—with video of cityscapes dissolving into ink, floating flower petals, beautiful dancers and yes, parrots, all inspired by the destinations of the disembarking flights. The images sprawl across unconventional screens, including a four-sided elevator tower the height of a three-storey building completely covered in glowing LEDs, the first of its kind anywhere. The tower can look like a colossal clock, which becomes a high-rise with shatter-glass sides, then a night sky. Touch the sides of the tower, and your hand will set off interactive sensors that shoot a star straight to the top. That an up-and-coming Montreal firm won the contract to supply films to the movie industry’s hometown airport was a huge coup, says consultant Mike Rubin, whose consulting firm MRA International initiated the plan to turn the newest LAX terminal into a cutting-edge media experiment. It is part of the airport’s US$4.1-billion multi-year revitalization, the biggest public works project in the history of Los Angeles. Moment beat 14 competitors from around the world, including L.A. itself. Which confirmed what they already knew: they are unlike most other firms on earth. Moment Factory partners, Eric Fournier, Dominic Audet, and Saschin Bessette. “We’re in show business,” says partner Éric Fournier, in an effort to neatly define a category-defying company. 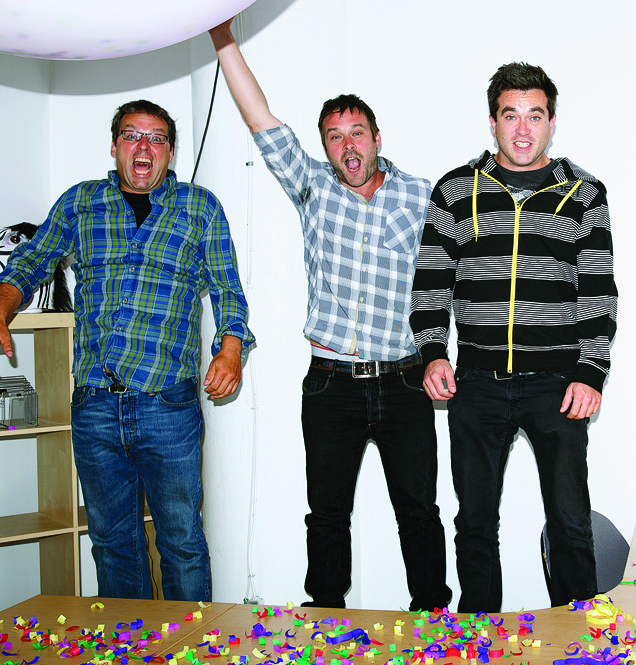 Founded in 2001 by three friends from Montreal’s rave scene, the firm helped drop 1,200 light-filled beach balls on a crowd of 100,000 unsuspecting fans during Arcade Fire’s song “Wake Up” at the Coachella music festival in 2011, a stunt that garnered a skrillion online views. They made a 19th-century church in Barcelona seem to dissolve into rainbow-hued flowers by beaming 16 projectors at its stone façade simultaneously. They hit the big time last year, when Madonna enlisted them to transform the playing field around her Super Bowl halftime show into a whirling sea of Vogue covers and three-dimensional geometric shapes. After it aired, they began fielding two to three calls a day from prospective clients, and their staff grew from 50 to 110. The private firm doesn’t share revenue figures, but they have seen 400% growth between 2007 and 2011, according to Deloitte’s Technology Fast 50. They hope to open offices in L.A. and Europe, and plan to put their in-house multimedia software, X-Agora, on the market. With 300 projects completed for clients from AMEX to Jay-Z, the company aspires to move beyond special effects for concerts, product launches and other events that live only for a moment. They want to build semi-permanent, large-scale media monuments—like the old bronze statues in public squares, except they run on software. 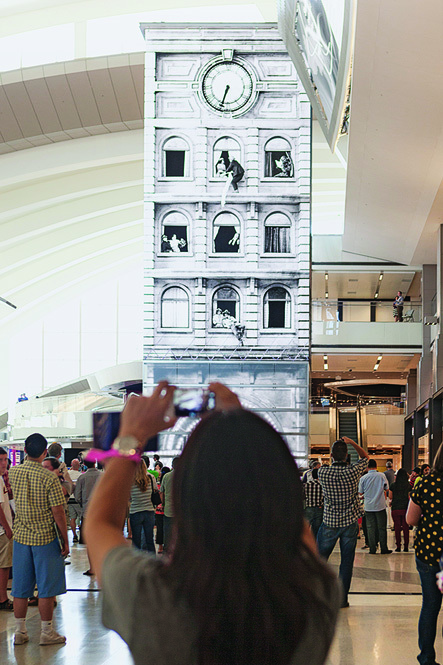 Their new video installation at LAX could redefine them. “This might be where Moment Factory goes from being a provider of entertainment services to an actual player on the cultural field by creating these mid-range to long-range projects,” says Prof. Patrick Leroux, who studies Montreal’s circus and arts groups at Concordia University. The assignment from L.A. made the Super Bowl look like community theatre. With a production schedule of about five months, Moment needed to produce four hours of top-quality content that would represent the essence of L.A. to the world—the equivalent of making 62 short films, each with different producers, actors and themes, some in 3-D. Screens would be triggered not just by passengers’ movements but by flight data, representing the cities the planes were bound for. Finally, they had to do it in secret, and while juggling 30-odd other projects, including Light, a new nightclub in Las Vegas with Cirque du Soleil that opened this past spring. They knew they could do it. They just needed a plan. Sakchin Bessette (or “Saky,” as everyone calls him) skateboards through the bright, drawing-covered interior of Moment Factory’s offices in a hoodie and pink T-shirt. It’s late December, the day of Isa’s big shoot. If the company’s co-founder and creative director is worried about the project he’s overseeing, it isn’t apparent. Dozens of skateboards litter the floor between desks. Saky and co-founder Dominic Audet got the staff using them, and now they’re the normal way to get to meetings. Suddenly, there is a loud bang. Staffers scream. Bessette has fired a snub-nosed toy gun, raining a payload of glitter all over the hallway. What would he do if he only had one more shot? “More!” he says, demonstrating his ebullience, if not actually answering the question. Bessette began his career doing slide projections at raves, then turned that partying ethos into a business in 2001 with Audet and pal Jason Rodi. Cirque’s then-creative director of new ventures Jean-François Bouchard noticed their work and hired them to help with a Halloween bash at the home of Guy Laliberté, the circus’s co-founder. Laliberté wanted to transform the inside of a domed tent into the interior of a jack-o’-lantern, a trick accomplished with a technique borrowed from planetariums. Before the event, they put a camera into a real pumpkin and shot Laliberté peering inside. At the party—after a dramatic rumble—they projected the video onto the ceiling of the tent, creating the illusion that the boss’s gigantic face was peering down and greeting his awed guests. “He liked that,” smiles Bessette. It was a move that became Moment’s calling card: find a way, any way, to elicit a reaction. In 2007, Rodi left and Fournier, a former vice-president at Cirque, joined the company. The following year, they were hired by technology-savvy hard rocker Trent Reznor for a concert tour. For a transparent video screen that sat in front of Reznor, the firm created swirling images that responded to his movements, but kept his flickering form visible to the audience. The feat garnered an award and a slew of new concert gigs. Moment got a reputation for unusual ways of solving problems—and provoking surprise. They were hired the next year by the city of Lyon, France, to produce an outdoor tribute to the history of cinema; it was to be staged in a park with barely any trees, meaning there was no place to hang a screen. So Moment suspended from cranes a 500-square-metre net made of chain mail. (The company has a library of glass, plastic and metals to help them solve such conundrums.) Invisible in the dark sky, the net was just substantial enough to show the gargantuan images projected on to it. The crowd thought the movie was being shown on the sky itself, laughs Julie Armstrong-Boileau, the firm’s communications head. In 2010, Microsoft hired Cirque du Soleil acrobats to perform at the launch of their Kinect gaming system. The circus performers gave Moment yet another boost by subcontracting them to provide visuals—a prime example of what Sid Lee’s Bouchard calls “the Montreal Force,” the tendency of French-Canadian media companies to share big clients, rather than compete for them. Moment created virtual, moving “water” Microsoft fans could walk on and nearly upstaged the games themselves by projecting decorations on to a mechanical, performing circus elephant. Colourful as their projects are, Moment’s headquarters remain in a vacant-looking, brown industrial building in Outremont, a couple of streets outside the city proper, but a stone’s throw from the hip Mile End neighbourhood, home to gaming firm Ubisoft and graphic novel publisher Drawn & Quarterly. The average age of Moment’s indefatigable employees is still around 29 (Aliya Orr, interactive director of LAX, is all of 26). But through ever more high-profile assignments, especially in the futuristic realm of “experiential design”—permanent multimedia environments like LAX meant to engage the public for years—the young company has enjoyed its own coming-of-age. Above their offices, Moment set up a secret penthouse studio dedicated to LAX and began to plan. The concept was so new that they had few references to crib from. Other than Times Square, immersive screen-filled settings on that scale didn’t exist. For inspiration, they looked to Singapore’s Changi Airport, which dulls the irritation of travel with fern gardens and ponds filled with fish. But Moment had LED screens to work with, not fish. Moment initially pitched the idea of having video games on the screens, but the airport rejected them as too diverting for an audience that, after all, is trying to get somewhere else. Moment proposed more Zen-like, relaxing games—sifting through sand, piling bricks. Those got the thumbs-down, too. With Sardi, they settled on video that ferries stressed-out passengers through an engineered mood experience. The first thing passengers see after security is smiling L.A. locals jumping in slow motion on the Bon Voyage Wall, explains Samuelson, leaning over a miniature version of the terminal miniature that takes up a room of the hidden penthouse studio. “We think of it as a good-mood gateway. You’ve had this tough experience, you had to take your shoes off …you want to give people a moment of excitement and adventure.” In the midst of the hall is the 22-metre-tall, four-sided Time Tower, so large that a single image on it must be stored across five separate computers. This is Moment’s attempt at a landmark structure—something on the order of Chicago’s Crown Fountain with its giant, water-spouting video screens or the 186-square-metre HD screen that fills the lobby of the Comcast Center in Philadelphia. For its attempt at a digital monument, Moment built a structure capable of as many effects as a television has stations. At times it will barely flicker, seeming to be made of solid glass. But when the clock strikes the hour (the average span passengers wait for their flight), the tower will launch into a three-minute routine called Dance Time. At this moment, it becomes an Art Deco clock, its face opening to reveal a Busby Berkeley-style extravaganza. Showgirls spin like gears, in a nod both to old Hollywood and the time distortions of air travel. There are other tricks. The tower is a functional elevator taking people up to a premium lounge. When an elevator lands, it will set off a subtle glow. Sometimes shadowy figures will appear to travel up and down its height—a trompe l’oeil effect, as the inner elevator isn’t actually visible from outside. “Hopefully that’ll mess you up for a minute,” says Samuelson. When their time in the terminal is ending, passengers will pass the mind-bending Portals, two rows each containing 10 LCD towers. Arrayed along two concourses from the lounge to the gates and fitted with motion detectors, the Portals’ video ripples and changes when passengers walk past. Even better, they play music tied to the flight that is actually about to take off. A Dubai-bound pending flight will mean passengers trigger the Arabian string instrument the oud; a Chilean destination will cue the charango. The faster people run to catch their flights, the more the Portals come alive. It may produce the eerie sense the building knows where you’re going. All this sleight of hand is made possible by X-Agora, the in-house software that helped Moment win this contract and which they soon hope to put on the market. It is a central brain that can juggle stills, music, interactive, text and video. By layering real-time data over a film clip, X-Agora will ensure that the clock which appears in Silent Era, a black-and-white film short, will always show the correct time. To gather the footage they needed, Moment’s directors spent the winter filming on California beaches and in far-flung flight destinations such as Rio de Janeiro. Surrounded by paradise, they learned the usual rules of moviemaking don’t apply. A typical shot in a movie lasts a few seconds, but quick cuts will seem shocking at three storeys tall. So directors opt for shots at least 15 seconds long; the largest screens have no cuts at all—images fade in and out dreamily. Another problem is speed. When a screen is 25 metres high, a happy child jumping on a beach appears to be plummeting like a rock. They don’t want passengers to be afraid, says Marie Belzil, one of the five team members overseeing the project’s multimedia production and a former creative assistant to the great Canadian theatre director Robert Lepage, so everything moves slowly. By April, the staff at Moment has built a laboratory to test their work. In a cavernous, disused government warehouse, they construct a nearly full-size model of the terminal and test-drive their clips. The scale reveals that the videos need to be slowed down even more. On a Friday night in early May, they decide to reward their exhausted staff and do what they do best—throw a party. Giggling employees pass through a mock security entrance manned by “flight attendants” into a cavernous space filled with music, beer, food and versions of the airport’s screens, with all their movies running at full tilt. It’s one way of blowing off steam when so much is on the line. After all, the LAX project is already supposed to be close to completion. Instead, on-site testing has not even begun, because the airport’s construction of the high-tech screens has been hit by delay after delay. “I can’t paint if the wall is not there,” says LAX executive producer François Morel, in the midst of the party, worry in his voice piercing the booming techno. The video looks ready. On a testing screen behind Morel, Isa the parrot flies through a jungle in Phantom slow motion, every needle-thin barb of every candy-coloured feather vivid and distinct. She is destined for the Storyboard, a cluster of irregularly shaped screens about 37 metres wide. Belzil, who made many of the clips whirling around her, has brought her toddler, who holds her hands over her ears. Outside, employees smoke, joke in French and wait for a school bus to take them away. It’s a fun party, but are these 20-somethings the best judge of what will relax airport visitors of all ages—children, seniors? The schedule has been scrapped. Moment had initially planned for an on-site setup, or integration stage, of four to five weeks; it will instead take four months. With the project still far from completion, they are now firmly in the realm of Plan B: get a minimum amount of content ready for the mayor’s ribbon cutting. But amid the team’s countless headaches, their content itself has been a saving grace. It looks, well, good. On the afternoon of June 6—two weeks before the ribbon cutting—20 VIPs mill about the terminal, waiting to seeing the Time Tower lit up for the first time. For the past week, workers on cranes have been laying the roughly 28-centimetre-square tiles, each of which corresponds to one very big pixel, on the tower. Deep underground, someone pushes a button. On the four-sided monolith, Dance Time begins to play. Around the massive room, the construction workers rushing to build the duty-free shops stop hammering. They take pictures on their phones. At the official launch on June 20, someone sets a large table in front of the Time Tower’s missing interactive base, camouflaging it. Relieved, Moment’s staff watch people watching their creations and hear the mayor laud their work. The best accolades of all have been ordinary people’s reactions, says Samuelson. At 2 a.m., the night before the gala launch, his team finally stopped testing Silent Era, the video which always shows the correct time. The night guard of a duty-free shop approached them. “‘Couldn’t you guys start it up again? Why did it have to stop?’” Samuelson recalls the man saying. For his crew, it was a moment of quiet triumph.